Born on 28 December 1892 in Liverpool, England - son of E. Woodward, Wallasey, England - at the time of his enlistment in 1915: trade as McGill student; single; no current or previous military service; Methodist; height of 5 feet 6 inches; chest of 36 inches fully expanded; medium complexion; grey eyes; medium hair. Attended McGill College, British Columbia, in the Faculty of Science from 1914 to 1915. 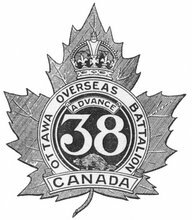 Joined the 38th Battalion, CEF, in Vancouver, British Columbia, on 5 March 1915 (number 411042) - transferred to Princess Patricia's Canadian Light Infantry, CEF, on 17 July 1915 - commissioned as a lieutenant in April 1916 - transferred to the 1st Tunneling Company, Canadian Engineers, CEF, on 19 June 1916 - wounded at Passchendaele, Belgium, on 9 November 1917 - invalided to England in November 1917 - served as an Assistant Instructor with the Canadian School of Military Engineering from 4 May to 6 August 1918 - repatriated to Canada in September 1919 - discharged from the CEF in October 1919. Awarded the Military Cross for his work at Messines, France, on 7 June 1917. ...this man was my great-uncle by marriage, married to my grandfather's sister Nina Harding Woodard. He was a gentle, quiet man with a shock of white hair, a little stout, and very kind to small, noisy nephews. We knew he'd had a hard war - he limped from an injury to his leg. I heard vaguely that he was a hero, that he had been gassed, that he'd had gangrene, but it didn't really come home to me until my father found his MC among my grandfather's effects. It led me to look into his history. He was a sapper with the Canadian engineers who tunneled beneath the German fortifications at Messines Ridge as part of the fighting at Ypres and laid massive mines there. On detonation,they produced the largest explosion ever to that date, heard across the English Channel in London. In the lead-up to this, the soldiers underground fought horrific engagements with shovels and entrenching-tools when they broke into each other's tunnels. I suspect that it was in an engagement of this type that he earned his medal, the highest of its type, for bravery while doing his duty. He died it the mid-'70s and is buried in North Hatley, Quebec, beside his wife.